So, as you go, make disciples out of people from all the nations, then immerse believers [See Mark 16:15-16] into the name of [i.e., to enter a relationship with] the Father, and the Son and the Holy Spirit. 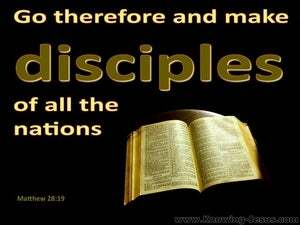 Go ye and disciple all nations, baptizing them in the name of the Father, and of the Son, and of the Holy Ghost. Go ye therefore and teach all nations, baptizing them in the name of the Father, and of the Son, and of the Holy Spirit. 18 And Jesus came up and spoke to them, saying, "All authority has been given to Me in heaven and on earth. 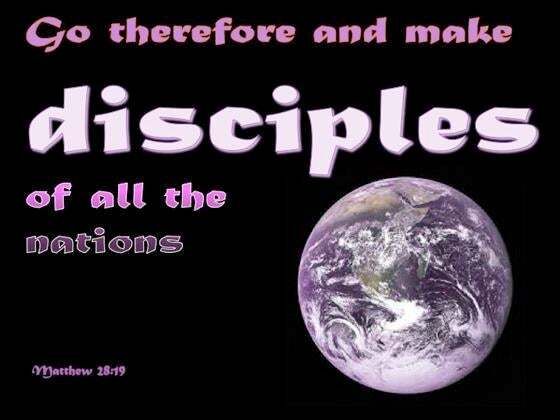 19 "Go therefore and make disciples of all the nations, baptizing them in the name of the Father and the Son and the Holy Spirit, 20 teaching them to observe all that I commanded you; and lo, I am with you always, even to the end of the age." "Behold, My Servant, whom I uphold; My chosen one in whom My soul delights I have put My Spirit upon Him; He will bring forth justice to the nations. "Come near to Me, listen to this: From the first I have not spoken in secret, From the time it took place, I was there And now the Lord GOD has sent Me, and His Spirit." And he said, "Into what then were you baptized?" And they said, "Into John's baptism." "Therefore let it be known to you that this salvation of God has been sent to the Gentiles; they will also listen." But I say, surely they have never heard, have they? Indeed they have; "THEIR VOICE HAS GONE OUT INTO ALL THE EARTH, AND THEIR WORDS TO THE ENDS OF THE WORLD." For all of you who were baptized into Christ have clothed yourselves with Christ. The LORD has bared His holy arm In the sight of all the nations, That all the ends of the earth may see The salvation of our God. "For I know their works and their thoughts; the time is coming to gather all nations and tongues. And they shall come and see My glory. And Jesus said to them, "Therefore every scribe who has become a disciple of the kingdom of heaven is like a head of a household, who brings out of his treasure things new and old."